Food Blog Forum 2014 couldn’t have had a more beautiful backdrop this year! 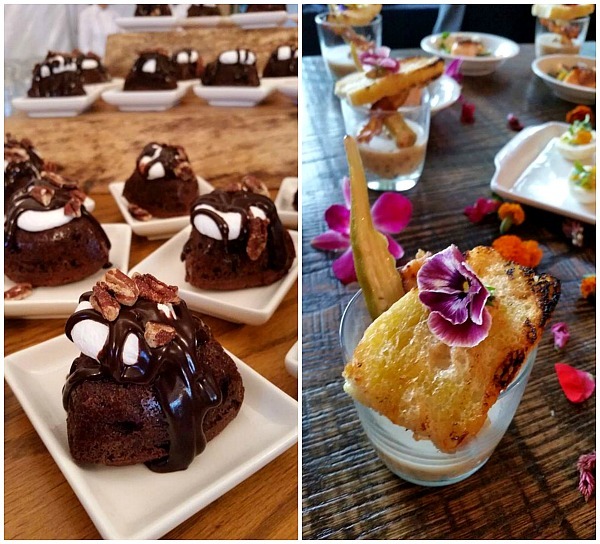 A few weeks ago, about 100 food bloggers descended onto Asheville, NC to reconnect with old friends, make new friends, enjoy some fantastic food and to learn from some of best bloggers out there! 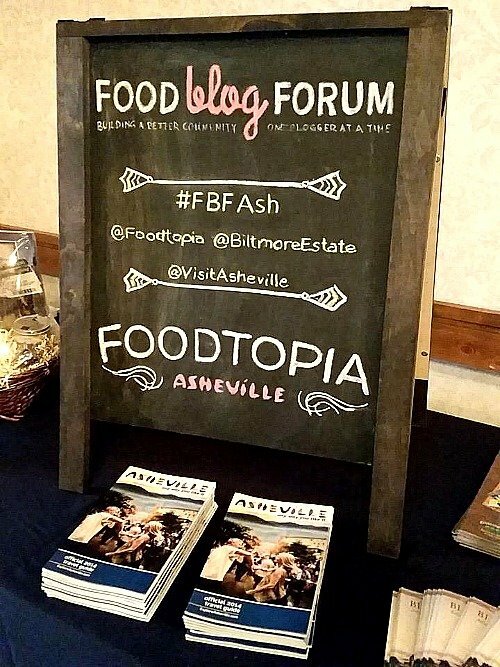 All of the people behind the scenes of Food Blog Forum and Foodtopia/Asheville worked incredible hard to make sure that everything went perfectly! Huge Thank yous to Jaden & Scott from Steamy Kitchen, Todd & Diane from White on Rice. Julie & Curtis from The Little Kitchen , and Lindsay and Taylor from Love and Olive Oil! I’d also like to thank Foodtopia/Asheville for everything that they did! During our first evening in Asheville we all attended a welcome party called, Moonshine Madness! 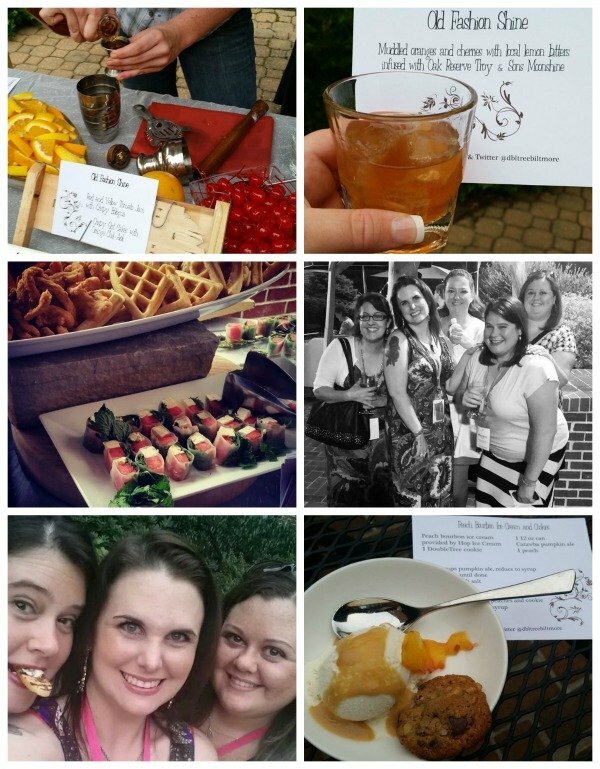 This fantastic evening of shine, treats and music was hosted by the Doubletree Asheville-Biltmore and Troy & Sons! 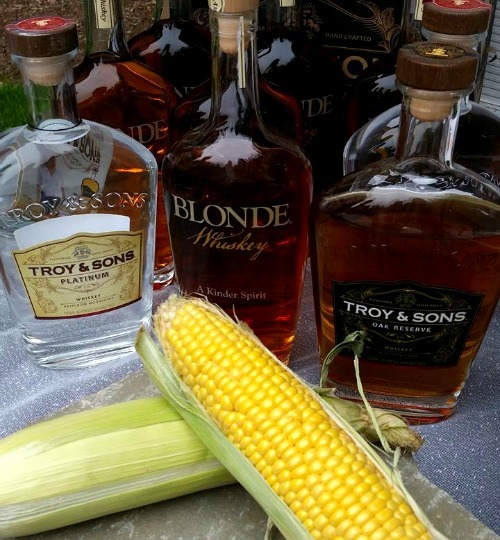 Did you know that Troy & Sons is one of few woman owned distilleries in the USA? How awesome is that! They treated us to some wonderful cocktails, delicious nibbles and beautiful swag bags that we filled to the top with locally made items/foods! Middle Left: Liz from A Nut in a Nutshell, Crystal from Mrs. Happy Homemaker , Janet from The Army Mom, Morgan from Peaches, Please! and I! 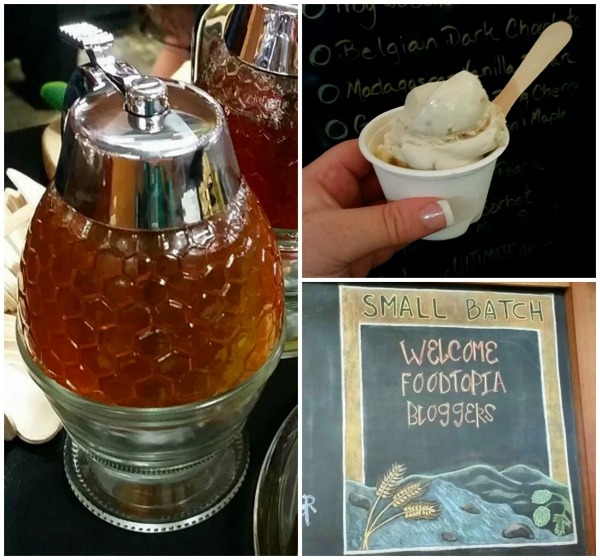 Peach Bourbon Ice Cream and so much more! 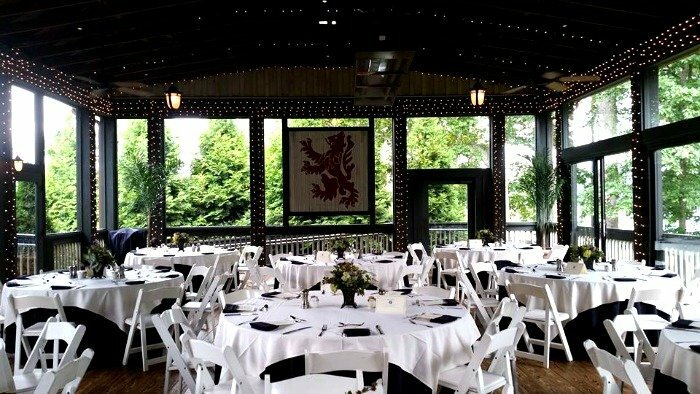 Then on Monday we drove over to the beautiful Lionscrest at Biltmore for the conference! We had a full day of learning but stopped half way through for lunch downstairs! We snuck down a few minutes early so that we could snap a few photos before everyone came in! Didn’t they set up the most beautiful place for our lunch! Biltmore really treated us well! 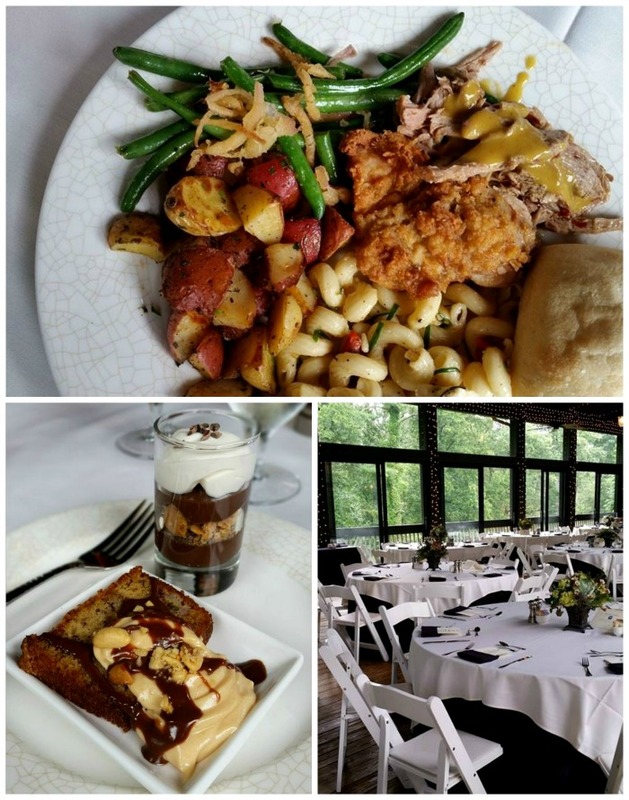 We stuffed ourselves with Sweet Tea Brined Fried Chicken, Sautéed Green Beans, Herb Roasted Potatoes, Pulled Pork with NC Gold BBQ, and Cavatappi Pasta Salad! Oh and don’t forget the desserts! I couldn’t decide on which one to try! So… I tried both the Dark Chocolate Pudding with Malt Cream and the Banana Bread with Caramel Mousse, Chocolate Sauce and Salted Peanuts! After our conference we were whisked away and soon found ourselves standing on the steps of Biltmore! 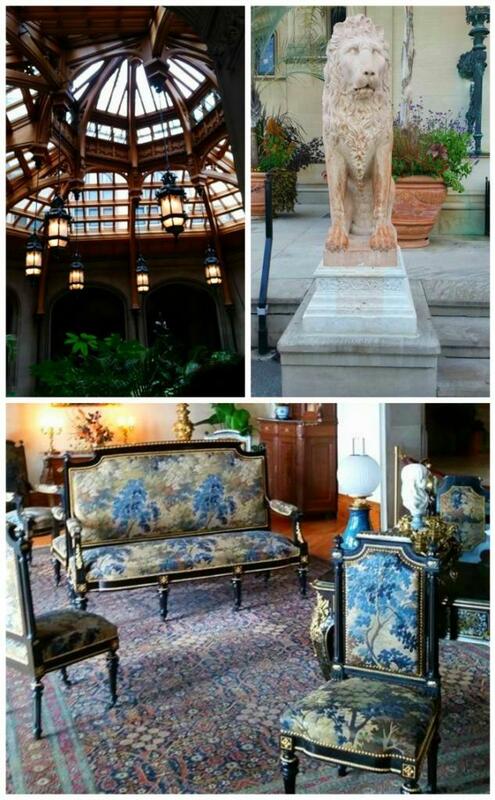 They had arranged for us to have a private tour of the Biltmore! 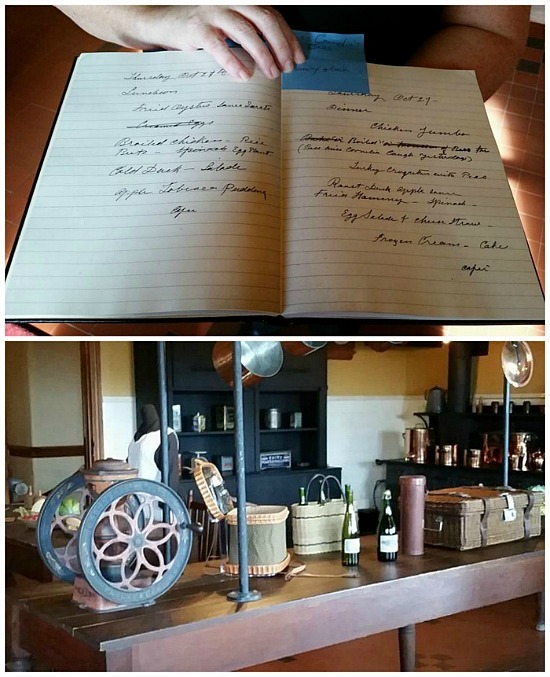 Not only did we get a tour but we got to go down to the Kitchen and the Butler’s Pantry! Look at that! That’s the Vanderbilt’s Menu Planner! Now normally you aren’t allowed to take photos inside of Biltmore but our hosts were so gracious and granted up permission to take as many photos as we wanted! After we had our tour of the beautiful Biltmore, we were again carried away to a stunning venue for dinner. 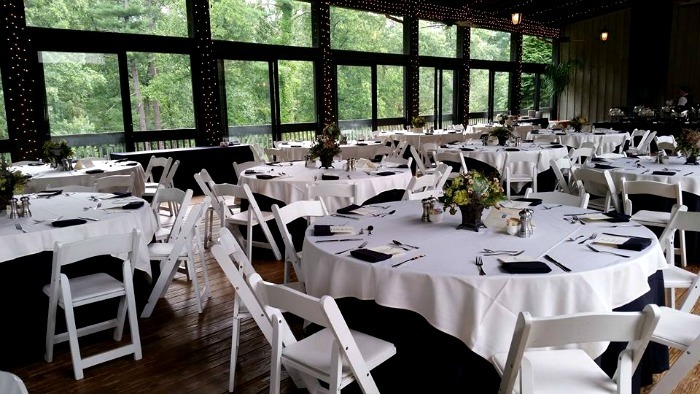 This venue was called Diana and the view of the Biltmore and Blue Ridge Mountains behind us were just amazing. The chefs from the Biltmore restaurants were creating mouth watering dishes for us to try! The Mississippi Mud Cake with Bourbon Marshmallow, Chocolate Caramel Sauce, and Salted Pecans above was my favorite dessert of the evening! Oh my and this Biscut Bar! 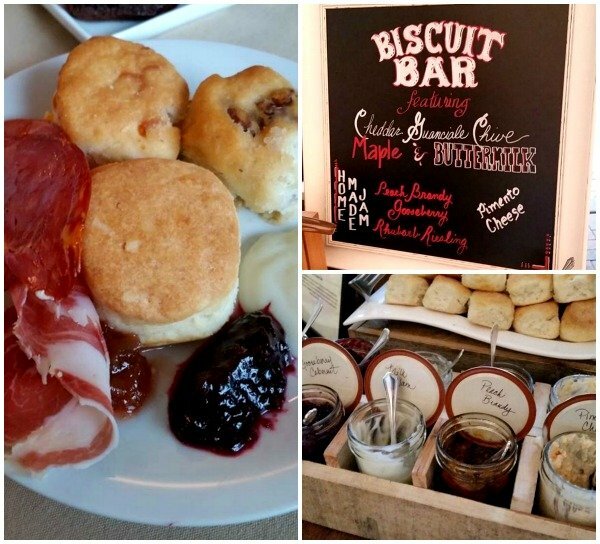 The maple bacon biscuits with milk jam was “to-die-for”! Bottom: Me and Morgan from Peaches, Please! 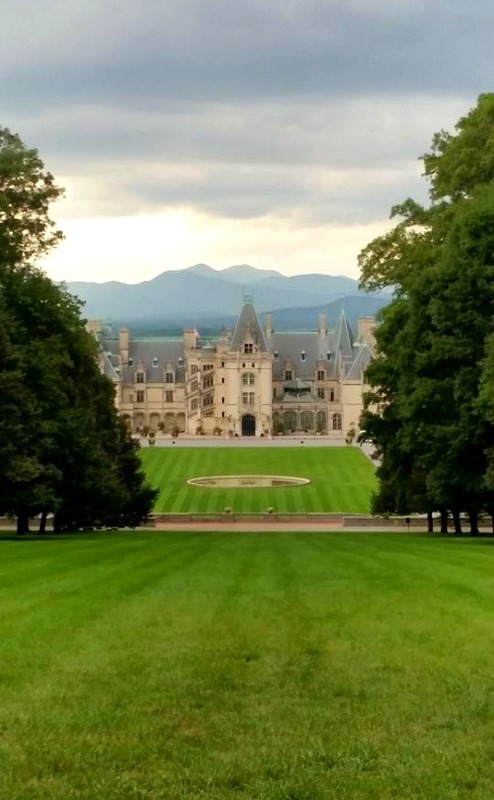 A memorable way to end a fantastic day at Biltmore! 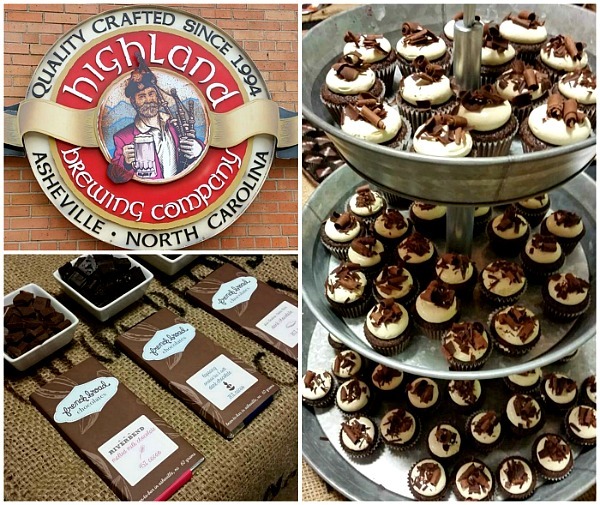 Tuesday we got to sleep in a little 😉 and then headed over to Highland Brewery for the Taste and Sip event! There were samples for all sorts of local food companies! French Broad Chocolate Company was there with their fantastic chocolate samples, truffles and mini cupcakes! There was also honey from Asheville Bee Charmer! I tried some of the best honey I’ve ever had thanks to their honey tasting bar! I am IN LOVE with the Fireweed honey that they had! I’ve got to find some! I just LOVED the ice cream that I had from Ultimate Ice Cream! They served up the most amazing bacon maple ice cream and the summer peach was super good too! I’d travel back to Asheville just for that ice cream! After lunch we went over to visit Looking Glass Creamery! 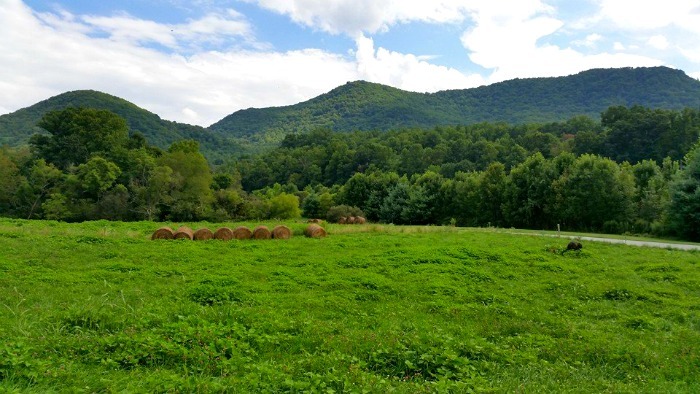 We looked over the beautiful mountains and had samples from Blue Kudzu Sake Company and Sunburst Trout Farms! 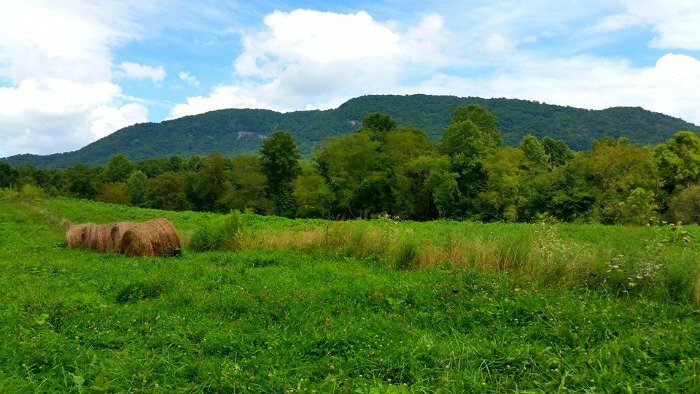 Then we skipped on over to Hickory Nut Gap Farm and took a little walking tour though the fields! I just can’t believe how lucky they are to have this view everyday! We finished our day with a food tour in downtown Asheville! I wish that I had gotten better photos of the downtown tour! I may try to add some later, but I was using my phone and it was dark….each…. phones and darkness don’t really get along! And one last time before I leave, I just wanted to again say, THANK YOU to Steamy Kitchen, White on Rice, The Little Kitchen , Love and Olive Oil and Foodtopia/Asheville and everyone else that worked so hard to put this together! It was amazing! so much fun and so much YUM! I followed along on Instagram…and wished I was there the whole time. 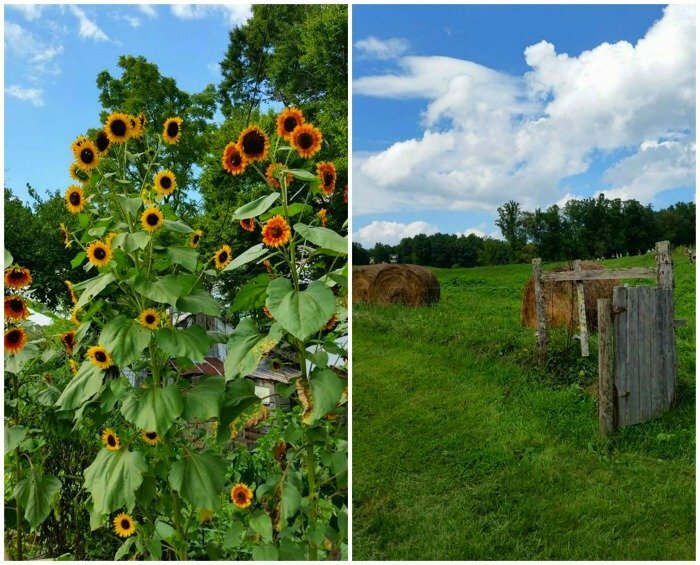 Beautiful photos! Thank YOU Angie!! Loved seeing you again. I wish I had been able to go. Next year. This looked like so much fun, and what a gorgeous venue. I am so jealous! What a wonderful time you had. 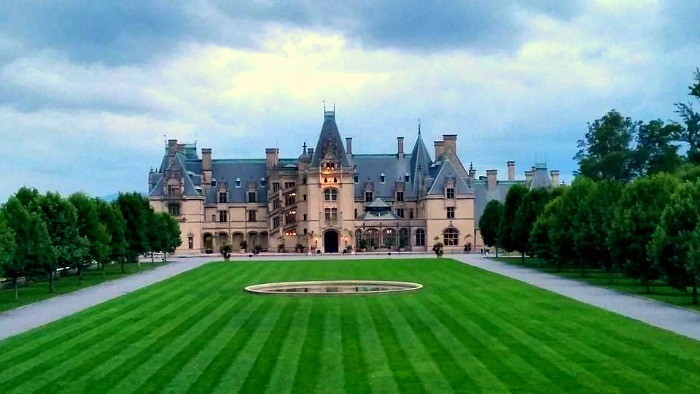 I have always wanted to go to Ashville-Biltmore. Maybe this Christmas! You had so many great experiences. Everything looks and sounds so amazing! Wish I could have gone, glad you shared your experience! Amazing! I hope I get to go to a conference sometime. Wow! What a fun conference! So jealous! Looks beautiful!! Those desserts! Good gravy, they look amazing!!! This needs to go on my list of things to attend. I LOVE that you got to sample Troy & Sons. They’re my favorite American distillery and Asheville in general is so great for foodies. I was there! I have to say that it was one of the best trips of my life. I have added Asheville to my list of places that I would like to live. I wish I could have gone to FBF Asheville! I have never been to Asheville but it looks amazing! I so wish I could have been there this year – I’ve always wanted to go to the Biltmore. Gorgeous! A bar just for biscuits? Yes, please! And those manor houses look like they could be European estates. Love the setting!